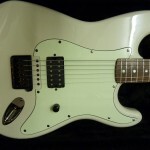 A good friend of mine requested that I build him a white stratocaster style guitar after he had seen the ‘Duck’ guitar I built for my brother Lee. 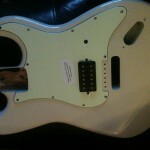 Using a spare Squier neck I had temporarily fitted to my first guitar (Encore unknown model), I just needed to source a body and use a few spares. This was not intended to be a playing guitar and was planned for a wall hanging, although I wanted it to play and sound well regardless. 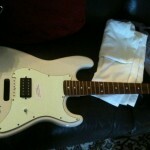 After searching ebay I managed to find a cheap early 90’s Dimarzio humbucker and a thin Squier Affinity body. 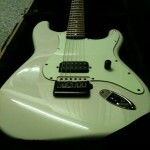 Utilising the spares box, I built and wired up this guitar over eggnog and Christmas music during the Christmas break. 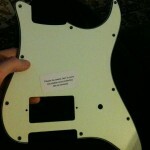 I had decided to go for a very minimalist build, and opted for the Tom DeLonge style single Volume pot placement. 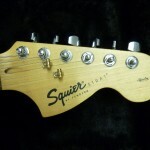 The neck is quite fast, although it would benefit from a re-fret. 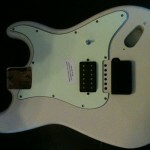 The unknown pickup was god-awful and reminded me very much of my first Encore guitar’s sound.